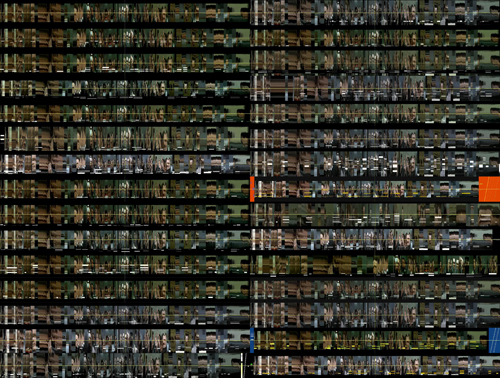 Image: Detail of sliced visualization of thirty video samples of Downfall remixes. See actual visualization below. As part of my post doctoral research for The Department of Information Science and Media Studies at the University of Bergen, Norway, I am using cultural analytics techniques to analyze YouTube video remixes. My research is done in collaboration with the Software Studies Lab at the University of California, San Diego. A big thank you to CRCA at Calit2 for providing a space for daily work during my stays in San Diego. The following is an excerpt from an upcoming paper titled, “Modular Complexity and Remix: The Collapse of Time and Space into Search,” to be published in the peer review journal AnthroVision, Vol 1.1. A note will posted here, on Remix Theory, announcing when the complete paper is officially published. The excerpt below is rather extensive for a blog post, but I find it necessary to share it in order to bring together elements discussed in previous posts on Remix and Cultural Analytics (see part 1 on the Charleston Mix, part 2 on Radiohead’s Lotus Flower, and part 3 on the Downfall parodies). The excerpt has been slightly edited to make direct reference to the previous postings, and therefore reads different from the version in the actual text, which makes reference to sections of the research paper where more extensive analysis is introduced. Consequently, in order for this post to make more sense, the previous three entries mentioned above should also be read. The following excerpt references sliced visualizations of the three cases studies in order to analyze the patterns of remixing videos on YouTube. The reason for sharing part of my publication now is to bring together the observations made in previous postings, and to make evident how cultural analytics enables researchers invested in the digital humanities to examine cultural objects in new ways that were not possible prior to the digitalization process we have been experiencing for the last decades. How a meme evolves based on the first remixes that a user may find can be evaluated by developing visualizations of the three cases studies that show the editing of the video footage over time. To accomplish this, I took the frames of thirty videos of each meme and sliced them in order to examine the types of pattern the editing actually takes. What we find is that with the Charleston Remixes the video footage stays practically the same except for a few remixes in which the footage of Leon and James dancing was used selectively as part of bigger projects. “Mr. Scruff - Get a Move on | Charleston videoclip” is one of these exceptions, in which the video is re-edited to match the sound (see slice detail below). Another is “Charleston & Lindy Hop Dance ReMix - iLLiFieD video.mix (Version),” (also see below). 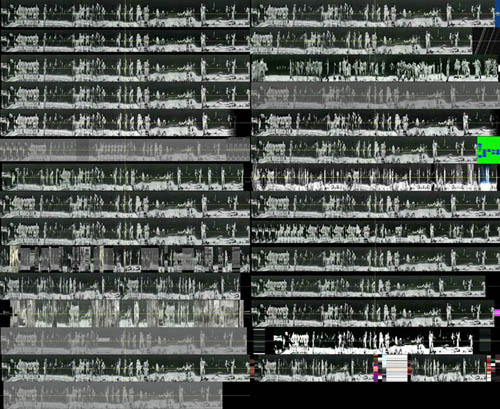 Image: A two column slice visualization of the 29 of 30 remixes (one remix was omitted because the footage is not the same performance. That video is not relevant to evaluate how the video footage of this meme is left intact). For a full list of this visualization visit: http://remixtheory.net/remixAnalytics/ and select “Charleston Video Slices.” View large version of this image. Image: this is a slice visualization of “The Charleston and Lindy Hop Dance Remix.” When comparing this sliced image to other slices in the two-column visualization above, one can notice the selective process with which footage from the Charleston Style was used. This video is much longer than the original footage, and has been compacted in order to show how the video was selectively edited. To view this remix, visit http://www.youtube.com/watch?v=POupa2sW1UI&feature=player_embedded. This video was uploaded to YouTube on May2, 2009. View large version of this image. Image: this is a slice visualization of “Mr. Scruff remix.” When comparing the sliced image to the other slices in the two columns visualization above, one can notice how the same footage was edited repeatedly to match the beat and sections of the song. This video is much longer than the original footage, and has been compacted in order to show how the video was selectively edited. Visit http://www.youtube.com/watch?feature=player_embedded&v=Bx5-itIA0pQ. This video was uploaded to YouTube on January 10, 2008. View large version of this image. Image: A two-column visualization of Lotus Flower Remixes. The original video by Radiohead is on the top-left. Most of the videos sliced in this sample were uploaded within the first two weeks after the original video was uploaded by Radiohead on February 16, 2011. For a full list of this visualization visit: http://remixtheory.net/remixAnalytics/ and select “Lotus Flower Video Slices.” View large version of this image. In the Lotus Flower Remixes (See image above) we can note that the editing of the videos is quite diverse; the footage is remixed (heavily edited) to match the beat and the overall feel of the selected songs, with the very first videos. The Downfall remixes (see figure below) consists of video footage that for the most part has been left intact. What is remixed is the fake translation of Hitler’s rant. The subtitles for Hitler are sometimes in the middle of the screen, in others at the bottom; sometimes the typeface is small, and at times large. But in the end the video footage is left intact and the translations very much obey the rhythm of the original editing. Image: A two-column visualization of The Downfall Parody remixes. The original video with no subtitles is on the top-left. Videos sliced in this sample were uploaded between 2007 and 2011. At the moment it is not certain whether the 2007 upload was the first because many remixes have been taken down by YouTube. For a full list of this visualization visit: http://remixtheory.net/remixAnalytics/ and select “Downfall Video Slices.” View large version of this image. Image: Visualization of Downfall video, with proper English subtitles. The thin horizontal white bars near the bottom of the frame are the subtitles. To view this video visit: http://www.youtube.com/watch?v=4bmkUlXp5sk&feature=related. Some of the remixes present the subtitles in yellow. View large version of this image. Image: visualization of “Hitler’s Reaction to the new Kiss album,” a video remix in which Hitler rants about the album’s title “Sonic Boom.” The subtitles (the thin horizontal white bars) in this case move all over the frame. To view this video visit: http://www.youtube.com/watch?v=nwOLfppXhsk&feature=youtu.be. View large version of this image. We can note in the three case studies that the approach of remixing is in part defined by the way the original remix or footage was produced. With the Charleston Remixes, most contributions leave the video footage intact. No major editing took place until September 2007, that is a year and four months after the first upload. With the Lotus Flower Remixes, editing of the footage is done from the very beginning, while with the Downfall parodies, it does not place at all. Why would this be? Based on the diagrams (see the link “visualization of links” for each case study on the page remixAnalytics) and patterns of editing that I present, we can note that the later videos are in fact responses to previous productions. In the Charleston Remixes, the video footage is left intact because it is intact in the first remix. With Lotus Flower, the original footage by Radiohead is heavily edited, which gives remixers the license to immediately manipulate the footage in selective fashion—by omitting some parts of the footage while repeating others to match the selected songs. With the Downfall remixes, the result is similar to the Charleston Remix: the footage is practically left alone because the meme demands that the basis of the meme be that only the text be remixed; therefore, the only major shift takes place with the placement of translations on the screen: sometimes on the middle, but for the most part at the bottom. The only other shift we can notice with the subtitles is that they may crossover from one shot to the next based on the emphasis of the content that the remixer wants to make. But none of the Charleston and Downfall videos are as heavily edited as the Lotus Flower remixes. It is also worth noting that these are all selective remixes, which means that they all are dependent on a clear reference to the original source. If such reference is lost, then, the remix withers, and would become either a badly concocted reference, or simply a product on the verge of plagiarism. One last element that needs to be considered, which apparently affects the production of the memes, as is also argued by a study on YouTube funded by Telefonica , and also supported by the research of Jean Burgess and Joshua Green  is that due to the viral emphasis on YouTube, online users are most likely to find an already remixed version of a video, and not the original if the remix has enjoyed more views. The exception to this is Lotus Flower, for which YouTube apparently always offers the original video as part of possible selections, on the first page of all results. This is likely because given Radiohead’s popularity, their YouTube channel has a large number of views. For the Charleston, this is not always the case, as the original footage sometimes will not come up with certain video remixes. For the Downfall meme, it is even more difficult to speculate how videos produced before 2007 affect users who currently search for the meme, because they are likely to find videos that are popular, but not necessarily the newest nor the oldest—but rather the most relevant based on the terms used for the search in relation to the number of views. For Burgess and Green this is evident based on their assessment of the emphasis of presenting popular videos first, and the fact that YouTube members deliberately find ways to promote their videos to become as popular as possible. See Jean Burgess & Joshua Green, YouTube: Online Video and Participatory Culture (Cambridge: Polity, 2010), 74.